The following posts can be seen here: Part II, Part III, Part IV. I know it has been a long time since I started this project, and now we’ll get things rolling. One of the main postponing motifs was that I took a long time trying to better understand the Manhattan and how I could get an awesome cocktail with the brands available here in Brazil. You can see the Manhattan as a little modification in the Old Fashioned, instead of using sugar we go for vermouth as the sweetner. 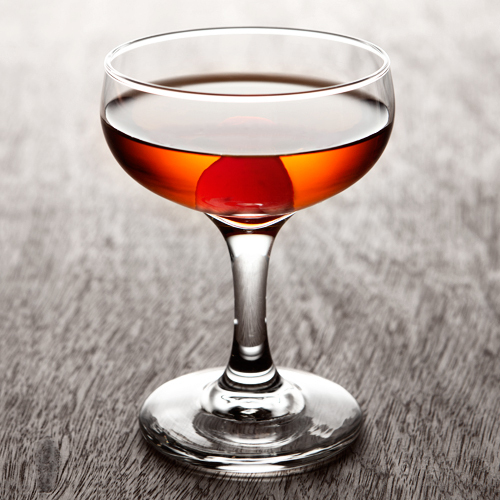 One of the main points now to consider is that the sweetness and spices flavors of the vermouth can not overwhelm our base spirit, for each brand of whiskey there will be a better suited brand of vermouth and a magical ratio that will make the cocktail sing. That’s the most amazing think in the Manhattan. Another important point to consider is dilution (and temperature), since the cocktail will not be served over ice and must therefore stand the test of time (or the test of warmth). Remember that a cold cocktail will taste less sweet, but as the drink warms, the sweetness will show up. With that being said you can imagine the taste of the cocktail as a drier and more complex Old Fashioned. In the nose you are greeted with vermouth and in the mouth the Bourbon stands tall releasing all its flavors in the sweet vermouth + bitters canvas. Also a word about texture, you might not just consider a brand and ratio of vermouth that will sweeten and enhance your spirit, but also one that will give a good mouthfeel. With the most accessible brands here in Brazil I settled on this recipe. Stirred and strained into a pre-chilled cocktail glass. Sans garnish. I really don’t think a citrus zest will help this complex, but balanced cocktail. Neither will any sweet cherry embebed in syrup. Maybe a fresh cherry would fit well, if in season. The Manhattan was a joy to learn how to make and in further posts we will expand our notions of the vermouth+bitters+spirit combo.